For Quake III Arena fans that wanted their cherished game on the Xbox 360, Quake Arena Arcade is a brilliant port. We have some questions, though. Does that audience even exist? Was Pi Studios and id Software aiming for a new audience? Pi Studios and id Software might have missed their intended audience because nobody is playing online. It's a ghost town. You will not have a choice as to what mode or map you want to play. You will take anything you can get, and when you do find a game expect a Quake savant waiting for you. This Xbox Live Arcade release does not bring accessibility with it. While anecdotal, every match we played included experts that lowered our self-confidence. Quake Arena Arcade agrees with Billy Prestonthat nothing comes from nothing. You get from Quake what you can put in. You will have to practice, practice and practice. Fortunately, there is an option to play offline with bots. Nothing surprising or spectacular, but at least the option exists. It's a simple mode, and simplicity is what Quake is about. There is nothing complicated about Quake, and this refreshing simplicity is what made Quake III such a fun competitive shooter. Stop worrying about squad cohesion, killstreaks and iron sights. Quake III made you focus on less and prioritized importance to shooting and map movement. There is a reason why people often link videos of competitive Quake III matches. They are brilliant. In Quake Arena Arcade, you will die again and again, but you will marvel at your nemesis' abilities. Arena Arcade is beautiful. While nostalgia helps, the mesh of gothic architecture and futuristic gizmos still looks great - a simple combination that remains fantastic. The visuals don't matter much, though. The environment starts blurring and becomes nothing but a blueprint in your mind as you race about and memorize power-up locations. However, the transition to a controller is rather difficult. Arena Arcade is fast, and the precise accuracy needed from weapons like the railgun is tough with a controller. Give it time and adjust though. It fits fine on a controller after you adapt. Arena Arcade is certainly impressive. Quake III has always been striking, and Pi Studios and id Software's newest incarnation brings it to another audience. However, it seems this audience does not give a damn. Matching a game with its correct audience is just as important as a game's creation (especially when a game is so dependent on the online experience). A wonderful game is available here, but no one cares. Unfortunately, they might not ever care. Quake Arena Arcade is Quake III Arena for a new audience. Unfortunately, that audience does not care about Quake III Arena. 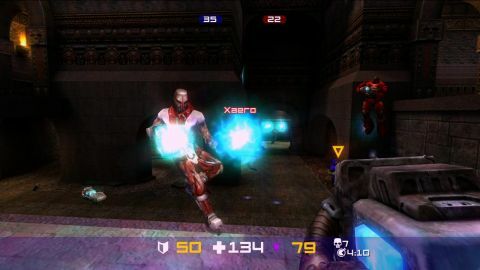 Thankfully, Quake Arena Arcade retains the wonderful simplicity of Quake III Arena, the futuristic gothic environments and absurdly quick pace.